We'll be watching closely for any legislation that could impact library funding. After the November elections Michigan's lame duck session could bring unexpected and unwelcome surprises. In politics, a lame duck is an elected official whose successor has already been elected. That will encompass all of Michigan's political leadership from the Governor to both legislative chambers. This means lawmakers are free to make decisions with little fear of consequence. Lame duck politicians result from term limits, planned retirement, or electoral losses. We will be reminding these legislators of the importance of continued library support throughout this session. We fully expect legislation to be signed into law by the end of this legislative session. Recently, the Senate Health Policy Committee took testimony on SB 828 and 829, which would provide liability protection for libraries when providing the life-saving opioid antidote naloxone, common brand name Narcan, to an overdosing patron. As a result of our testimony, the committee chair has requested legislation which would protect all public locations from liability including libraries. This has delayed the legislation briefly but the broader implications for public safety are tremendous. Kristin Shelley, MLA Legislative Committee Chair and MLA President-elect gave an excellent overview of why the bills are needed. She also provided a heart wrenching story of a death that occurred at a library where she worked years ago. The committee heard firsthand how a life might have been saved if naloxone had been available then. Library of Michigan, the Michigan Department of Education and MLA have been working together to see this protection added for our libraries. SB 828 and 829 would allow libraries and library employees or agents to purchase, possess, distribute or administer in good faith an opioid antagonist without possible subject to criminal prosecution. The law would provide immunity to libraries like that provided to public schools. For a recent NPR Stateside interview about public libraries' response to the opioid crisis with Kalamazoo Public Librarian Kevin King and MLA Executive Director Gail Madziar visit the Stateside page of the MichiganRadio.org website. In early September, the Michigan legislature adopted the minimum wage increase initiative, officially taking it off the November ballot. 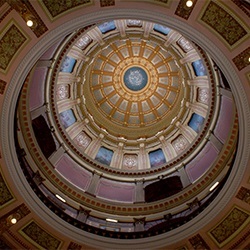 The legislature had previously adopted two other initiatives, paid sick leave and repealing the prevailing wage. Now, only three proposals will appear on the November ballot, and the state elections board has finalized the language for all three. Permit retail sales of marijuana and edibles subject to a 10% excise tax, dedicated to implementation costs, clinical trials, schools, roads, and municipalities where marijuana businesses are located. If passed, Proposal 1 would make Michigan the 10th state to legalize recreational marijuana. The proposal is lead by the group Coalition to Regulate Marijuana Like Alcohol, and it's opposed by the group Healthy and Productive Michigan, which is backed by the Michigan Chamber of Commerce. Two of Michigan's three gubernatorial candidates support the ballot: Democrat Gretchen Whitmer and Libertarian Bill Gelineau. Republican candidate Bill Schuette disapproves of legalizing recreational marijuana, but says if the proposal passes, he will "respect the will of the voters." A proposal to amend the Michigan Constitution to create an Independent Citizens Redistricting Commission. If adopted, this amendment would transfer the authority to draw Congressional and State Legislative district lines from the Legislature and Governor to the Independent Commission. The selection process will be administered by the Secretary of State. Thirteen commissioners will be randomly selected from a pool of registered voters, and consist of four members who self-identify with each of the two major political parties, and five non-affiliated, independent members. Current and former partisan elected officials, lobbyists, party officers and their employees are not eligible to serve. The proposal is to be voted in the November 6, 2018 General Election. Proposal 2 would amend Sections 1, 2, 3, 4, 5, and 6 of Article IV, Sections 1, 2, and 4 of Article V, and Sections 1 and 4 of Article VI of the Michigan Constitution. The lead-up to the proposal's inclusion on the ballot was not without controversy. A group funded by the Michigan Chamber of Commerce called Citizens Protecting Michigan's Constitution filed a lawsuit claiming the proposal was unconstitutional. That legal challenge was rejected by the state Court of Appeals and later by the state Supreme Court. A proposal to amend the Michigan Constitution of 1963 by amending Article II, Section 4. If adopted the proposal would provide citizens qualified to vote in Michigan with the following rights: to vote a secret ballot; for military and overseas voters to be sent a ballot 45 days before an election; to vote straight party on all partisan general election ballots; to be automatically registered to vote when obtaining a driver's license or personal identification card from the Secretary of State, unless the person declines; to register to vote by mail on or before the 15th day before an election; to register to vote in person at any time with proof of residency; to vote an absentee ballot, by mail or in person, without giving a reason; and to have election results audited to ensure the accuracy of elections. This proposal is to be voted on at the November 6, 2018 general election. The Voting Rights Policies Initiative would amend Section 4 of Article II of the state constitution. The initiative is lead by the group Promote the Vote, and backed by the ACLU and the League of Women Voters of Michigan. The 2018 election is Tuesday, November 6.